We live in a distracting time to be a human being. We’re are constantly inundated by emails, texts and the need to broadcast your fabulous pumpkin-spice-whatever to the masses via Snapchat, Instagram and Facebook. Because this is detrimental to our mental focus, it’s no surprise that Americans are pretty terrible drivers, and admit to doing some unbelievably foolish things behind the wheel. And it doesn’t just pertain to what motorists do with social media, according to a lengthy infographic compiled by Roadloans.com. Using data from four separate surveys that asked 4,000 Americans about their worst driving habits, the numbers shine a light on our collective attention span -- the metaphorical equivalent of a 6-year-old living through a Ritalin shortage. So what do Americans do behind the wheel when no one is around? Sixty-six percent admitted to picking their nose -- an innocuous enough offense -- but, another 60% admitted to reading something -- like the news or a friend’s Tumblr -- on a device. 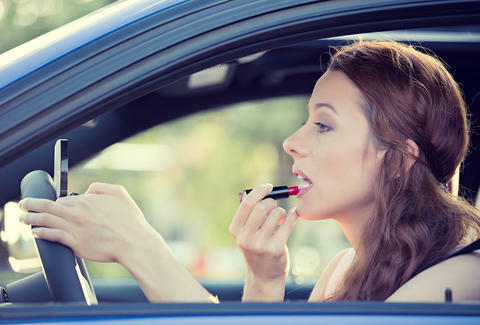 But it gets far worse: 52% ate a full meal while driving, and 20% applied makeup or deodorant -- because physical appearance is more important than possibly dying in a fiery car wreck in the good ole’ USA. When it comes to texting and driving -- the thing everyone has done and will probably continue to do even though it’s illegal in 46 states, according to the Governor’s Highway Association -- the numbers are bit more mixed. 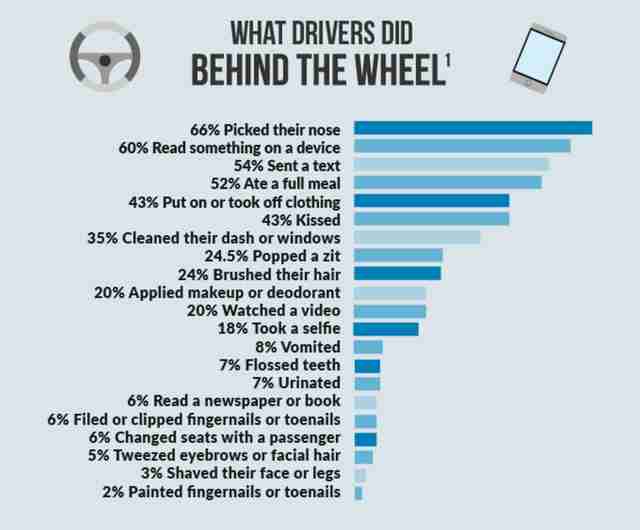 Eight percent confess that they text while driving daily, while 13% do it only “once a week,” which sounds suspicious. Fifty one percent of respondents did their best Charlie Brown impersonations, noting that they’ve never texted while driving in their wholesome, law-abiding lives. What possibly leaves the worst impression here, though, is that 20% of Americans admit that they’d quickly drive away after hitting a car in an empty parking lot. The honesty there is kinda commendable, though, and might deserve a high-five. There was no data on people filming themselves singing in the car, but if you'd like to see how that plays out, look no further.